The Yang Ming shipping line container ship Ym Utmost is unloaded at the Port of Oakland on Monday, July 2, 2018, in Oakland, Calif. The Trump administration on Friday, July 6, 2018, started imposing tariffs on $34 billion in Chinese imports. China responded with retaliatory tariffs. China said Friday it was "forced to take a necessary counterattack" and responded in kind to the United States after Washington placed tariffs on 800 Chinese import products valued at $34 billion. China said it applied retaliatory tariffs on 545 U.S. items, also worth $34 billion, "including agricultural products, vehicles and aquatic products," China's state-run Xinhua News Agency reported. Chinese Foreign Ministry spokesman Lu Kang said China is "completely justified" in its response to the U.S. tariffs, which he said "will disturb the global trade order, cause turbulence on the global market, and hamper world economic recovery," according to Chinese broadcaster CCTV. Lu warned that consumers and small businesses would be adversely affected, noting that, "Enterprises and people in the U.S. are also increasingly realizing the great harm ahead." The new tariffs went into effect one minute after midnight (0401GMT) Friday, Washington time. China's Ministry of Commerce spokesman Gao Feng told reporters Thursday that about $20 billion of the U.S. goods China targeted are backed by foreign investors, including a significant portion from the U.S. Hours before the U.S. tariffs were imposed, U.S. President Donald Trump threatened to further escalate the trade dispute by ultimately targeting more than $500 billion worth of Chinese goods, roughly equal to the value of U.S. imports from China last year. "We can probably say that the trade war has officially started," said Shanghai Jiaotong University economics professor Chen Feixiang. "If this ends at $34 billion, it will have a marginal effect on both economies. But if it escalates to $500 billion like Trump said, then it's going to have a big impact for both countries." The volley of trade tariffs has fueled concern that a prolonged trade dispute would hinder global economic growth, while inflicting damaging blows to U.S. farmers who stand to lose revenue. Growing trade friction worries some top officials of the U.S. central bank, who say it discourages investment that helps economic growth. The concerns were made public Wednesday in notes from the most recent policy discussion by leaders of the U.S. Federal Reserve, who set interest rates and other economic policies. Just days before Friday's tariffs took effect, the Chinese embassy in Washington issued a warning to its citizens traveling to the U.S. Chinese tourists were warned of things such as costly medical bills, the possibility of gun violence and robberies, seizures by customs agents and natural disasters. "Public security in the United States is not good," said an embassy statement published last week. "Cases of shootings, robberies, and theft are frequent." FILE - Chinese tourists take a selfie outside of the New York Stock Exchange, in New York, July 8, 2015. When asked Tuesday if the timing of China's travel warning was politically motivated, Foreign Ministry spokesman Lu said the embassy was obligated to issue the alert because the summer is the height of the travel season for Chinese tourists visiting the U.S.
"I think this is absolutely a matter that is in the scope of our duty," Kang said. China often issues warnings for Chinese travelers, usually in war-afflicted regions. But some foreign governments have accused China of using tactics such as curtailing outbound tourism to settle political or trade disputes, accusations that China typically denies. The United Nations reported last year that China has led the world since 2012 in the number of tourists who travel abroad. The U.N. said Chinese tourists spent $261 billion in foreign countries in 2016, more than double the amount travelers from the U.S. spent. 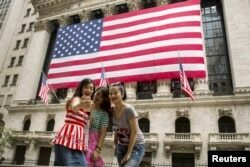 More Chinese tourists are visiting the U.S., according to the U.S. Commerce Department. It said nearly 3 million visited the U.S. in 2016, a nearly six-fold increase since 2009. Chinese tourist visits to the U.S. rank fifth behind Canada, Mexico, Britain and Japan. A 2017 survey of Chinese and other tourists by the marketing firm Nielsen found that half of the Chinese respondents said the safety of a destination would impact their decision on where to travel. VOA's Joyce Huang contributed to this report.